"Jon, you are telling me that you got 325 STEEM sent to you...Added another 25 and then sent it to someone else?" This amazing community project was created by @GeekGirl almost 2 weeks ago - You can check out the original post here. And in those 12 days, it has amassed a total of 377 STEEM between 20 Steemians....The end goal, get the 'torch' passed around to 1337 Steemians and see what the total will be! At the end, the STEEM pot would be either burned or donated to a commmunity run project to help the blockchain...No matter what, the end result is a HUGE win for STEEM. Guess what I woke up to this morning? Mark (Exyle) is one of those people! He's helped my journey on STEEM by creating content that regular people like myself can actually understand and get excited about when it comes to this blockchain. 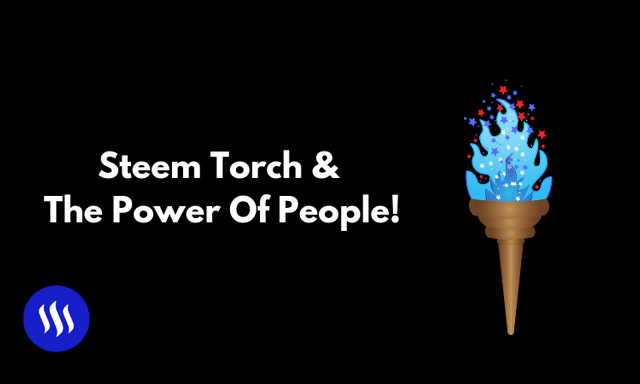 Steem Torch is the perfect project to showcase our excitement for this community and I think @exyle is the perfect Steemian to send the torch to next! There is real power here on STEEM. Want to learn more about Steem Torch? Be sure to follow @GeekGirl as well as all the Steemians the torch has been passed to! 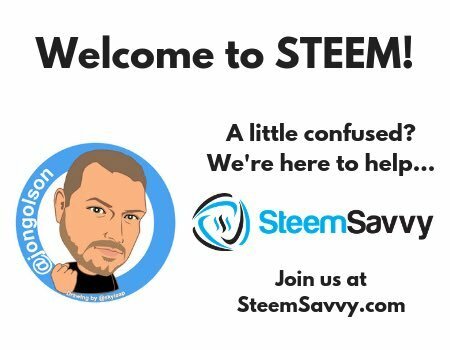 Join @SteemSavvy today and learn STEEM from A to Z! Such a great idea Cannot wait to see the results. it’ll be cool to see if we follow the rules or some of these whales start dropping hundreds every time they get the torch. Great stuff going on here , Jon. Mark is a great Steemian for sure. thanks man. yeah i agree. one of the best on the blockchain. Such a nice experiment. I am patiently waiting for those 1337 transfers. I really hope that the amount will be used for a good cause. Maybe funding a program...or charity. In any case this just indicates the trust and the power of human relationships on this chain. agreed. so awesome to see people come together for a good cause. best part is. we have no idea what that cause will be lol but we believe in community. That's an awesome experiment man! We should have an equivalent of the Olympic Games (keeping the proportions), I believe that's where passing the torch idea originally started. yeah it is. people to people right. that’s the power of community. Really cool idea and stuff started to passout the torch to next good person. Hope it can be a good number of STEEM can be collected. should do really well at the end of this. Cant wait to see it end up in the hands of some "controversial" subjects. lol. An interesting initiative to collect money. That shows how creative this blockchain is. right. it’s amazing how creative people are here. This is a great idea, it will be interesting to see this moving ahead with new steemians. already moved a few places. 1337 should be hit quicker when more people know about it. So awesome! You could say the torch is picking up STEEM. #1337 will be made a dolphin! Think the last person can either burn it or send it to a steem based project. whatever happens tho. it’s a win. 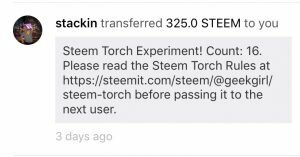 The Steem Torch is an idea I have never heard before and is a cool way to crowdfund a project after it passed through influential and aspiring people. Hopefully it doesn't stop while reaching the final milestone and will surely keep an eye on what the promoted project will be at the end. Cheers, great finding you here! Let's light up the world with Steem! absolutely. it’s getting brighter and brighter everyday. Wow! Twice? Shows how important you are buddy! A Steward of the Torch! haha haha famous in my own mind. Agreed. I highlighted him, @stackin and yourself as the three guys people should be following to begin their @steemsavvy journey. need to add a few more to that list but you guys have helped me more than you know. I’m so happy for this moment, I’ve waited for a little while to see where the Steem torch which is becoming a Steem fireball is going from our friend @steemcafe! Coming back to you worth celebrating! I’m heading over to make a new friend called @exyle, it’s fun to me and I am enjoying myself!